This page lists all additions and enhancements implemented on version 5 over the older version 4. If you are a new user or not aware of all the capabilities of AllWebMenus, please read the complete AllWebMenus features page for new users, otherwise continue reading below about what's new on version 5 alone. Use your own HTML code on selected menu items to achieve enhanced formatting or advanced functionality, from a simple working link, up to forms, flash objects, search boxes, even full-scale web pages! The “Auto Item Highlight” feature added, which specifies whether an item whose property matches the URL of the loaded web page will be highlighted by default. More stylish Themes are now included in the installation for free. Floating Images can now be added to any of your menu items, allowing for even more creative menu implementations. The Apply Theme dialog now allows you to view and choose Themes based on their <Type> ("Horizontal" or "Vertical"), facilitating your theme selection goals. The Horizontal Menubar feature is now available for both Main Menu and Submenu Groups along with several enhancements, through the enhanced <Type> property. Vertical Scrollbar for vertical Groups are now supported through the enhanced <Type> property. Automatic Scroll on Mouse Over also available. Multiple Rows and Columns on Groups are now supported through the enhanced <Type> property. A "Refresh" button now appears at the top-right corner of any property when its values are edited. The "Menu Positioning" shortcut has been added. The <Positioning> property is completely re-designed and enhanced, with a new positioning option added; you can now easily position your menu relative to an image existent in your pages. The "Manual Trigger Groups - Get ID and Trigger Code" feature of the <Positioning> property is completely re-designed and enhanced. The <Border> property now supports a different border type, size and color for each side (top, right, bottom, left) of a Group or Item. Joomla Menu add-in & component available. The "Ignore script in Preview Pane" option has been added in the 'Project Properties Advanced Scripting' form. The "Change Item to Hidden/Visible" command has been added. IE6 fix on select boxes (combos) now comes with more options to cover all cases (https websites for example). The Main Menu Size now appears in Preview Pane, so that you have an estimation of how large the menu will render in actual browser. 20 new Textures added in Image Gallery. 20 new Buttons added in Image Gallery. 54 new Bullets and Arrows added in Image Gallery. 40 Icons now available into the new "Icons" Category of Image Gallery. New Example Menu Projects added. "Add Item Before" action now available when building the Menu Structure. The "Check for Updates" command has been moved to the "Help" menu from the "Tools" menu. The <Text Decoration> property now supports the Overline and Strikethrough options. Ability to use custom variables instead of actual text in certain text-related properties has been added, allowing for more "dynamic" content in menus. New "Server-Side Menus API Add-in" version available for adding database-driven or programmable functionality to your menus. Read what users of previous AllWebMenus versions say about the upgrade. Arabic, Basque, Bulgarian, Catalan, Chinese (Mandarin), Chinese (Simplified), Chinese (Traditional), Croatian, Czech, Danish, Dutch, English, Estonian, Filipino (Tagalog), Finnish, Canadian French, French, Galician, German, Greek, Hebrew, Hindi, Hungarian, Icelandic, Indonesian (Bahasa), Italian, Japanese, Kazakh, Korean, Latvian, Lithuanian, Malay, Norwegian, Persian (Farsi), Polish, Brazilian Portuguese, Portuguese, Romanian, Russian, Serbian (Cyrillic), Slovak, Slovenian, Spanish, Spanish (Mexico), Swedish, Thai, Turkish, Ukrainian, Urdu, Vietnamese, and many more! 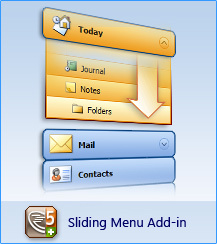 Create menus with sliding submenus, otherwise known as "slide menus", "expandable menus", "collapsible menus" or "accordion menus", through the Sliding Menu Add-in (extra license). - You can now show anything you like on an item through HTML code, like multiple click areas (<a> tags) with different destinations. The “Auto Item Highlight” feature added (under the “Advanced” section of the Main Menu’s Group Properties), which specifies whether an item whose property matches the URL of the loaded web page will be highlighted by default. New submenu appearance effects added with the ability to set custom appearance time delays. - Arrow  shows that the functionality of the old <Appears - When> property has been transferred to the enhanced <Appears - How> property, so that all features related to how the group appears are together. - Arrow  shows the new "Appearance Delay" feature. You can now specify how many milliseconds should the mouse remain over the parent item in order for the group to appear. - Arrow  shows the "Special Effects" feature. All "Unfolding" effects are now smoother than before and a new "Unfolding 3" effect has been added. New submenu disappearance effects added with the ability to set custom disappearance time delays. - Now you can also specify how the group disappears, allowing you to use many interesting effects in how your menus appear and disappear. - Arrow  shows that you can specify if all submenus are "sticky" or "non-sticky" within a group property, teamed with other "disappearance-related" values. - Arrows  and  show some new interesting variations of "sticky" submenus. By unchecking the default check on arrow  you can have the last opened submenu always visible, regardless of what the user does on the rest of the page. By also unchecking the default check on arrow  you can simulate a TAB-like behavior for the menu, as at least one submenu will always remain open no matter what happens on page or menu (see "XP Tabs" online example). - Arrow  shows the "Disappearance Delay" feature. You can specify how many milliseconds should the mouse move away from the group in order for the group to disappear. This option gives extra time to the group to remain open if the mouse accidentally slips out of the group and gets back again within the time limit specified. - Arrow  shows the "Special Effects" feature. You can specify an effect for the disappearance of the group. Combined with the "Appearance Method" of the <Appears - How> property, you can have interesting effects when navigating from submenu to submenu. A group can disappear using a "special effect". Unfolding 1, 2 and 3 effects are slightly different versions of the unfolding effect. Moreover, there are additional effects for the disappearance of the submenu in IE5.5+ browsers. These IE5.5+ only values make the submenu disappear using the "Unfolding 2" effect in the non-IE5.5+ browsers. - The advantage of a "floating image" is that it appears above the item's layer, which means that it may also exceed the item's area. Vertical Scrollbar for vertical Groups are now supported through the enhanced <Type> property. A "Refresh" button now appears at the top-right corner of any property when its values are edited. This lets you quickly refresh your menu preview without leaving the property layer that you currently edit. The <Positioning> property is completely re-designed and enhanced. - You can now implement all positioning methods easier. - Arrow  shows the new "Image-relative" positioning method. You can now choose to position your menu based on an actual image that exists in your pages. The advantage of this new positioning method is that you do not need to add any extra "ID" parameters inside your pages (apart from the menu-linking code which must always be present, regardless of the positioning method used). - Arrow  shows that the "Element-relative" positioning now supports a custom Anchor ID (eg: "ID123" instead of the default "awmAnchor-menu"). This is very useful when your websites are created through an Authoring tool or a CMS that adds default "ID" tags in all tables. In that case, it is now easy to use one of these IDs to specify your positioning instead of the "awmAnchor-menu" ID. With this method you have the ability to make individual groups popup by adding special trigger code on selected elements in your page. - Let actual elements of your page (images, links, etc.) be the ones that trigger the submenus instead of Main Menu items. In this case, you have total control of the layout of your page as you do not need to keep room for a rectangle where the Main Menu appears. You can even create cyclical menus with this method! Joomla Menu add-in & component available. Retrieve your Joomla menu from your Joomla website and import it into the AllWebMenus application to create stylish, feature-rich navigation menus, but not only! Fully customize your joomla menus adding your own non-joomla menu items with external or internal links, html-rich content, colors, borders, effects, designs of your choice and many more. Fully customize your wordpress menus adding your own non-wordpress menu items with external or internal links, html-rich content, colors, borders, effects, designs of your choice and many more. - This is very helpful, as you will not receive script errors in the Preview Menu panel when using scripts in the 'Advanced Scripting' property. These script errors may appear in Preview when your script refers to elements and functions that exist in your actual pages but obviously do not exist in the AllWebMenus preview page. - allowing for "empty" groups to be defined so that they are populated on-the-fly through a Server-Side Menu implementation. IE6 fix on select boxes (combos) now comes with more options to cover all cases (no "warning" on https websites for example). - The "IFRAME Fix", which uses an IFRAME to solve the problem without hiding the select box when a submenu intersects its area. This option has two small inconveniences: It may cause a small delay in very large menus and may show a harmless "warning" if you use it in HTTPS secure websites. "Add Item Before" now available when building the Menu Structure. Click on the "More info" button for details on this particular feature. In the "Custom Variables" compile property you can specify default initial values for any custom variable (eg: <awm:myvar>) you may have added to the applicable text-related properties. The “default” value is the text that appears in the menu where the variable is located. This value can be changed in HTML prior to the menu-linking code (which builds the menu), allowing you to alter the appearing text based on your conditions or preferences. You click on the "Custom Variables" option and see the "currencyvar" variable already detected and added to the list. Now, suppose that you are using PHP (same applies to any other language). //Any custom variable used in the AllWebMenus project must take a value *before* the menu-linking code builds the menu! //Otherwise, the "default" value of the variable will be shown. The only important thing to remember is that you have to enter the above code BEFORE the menu-linking code, otherwise the DEFAULT values of the variables will appear instead. The variables cannot be changed later on-the-fly, i.e. after the menu is build and shown. See the custom variables example that demonstrates this feature. See the Server-Side Menus API example that demonstrates this feature. If you are not aware of all capabilities of AllWebMenus, please read the complete AllWebMenus features page for new users.